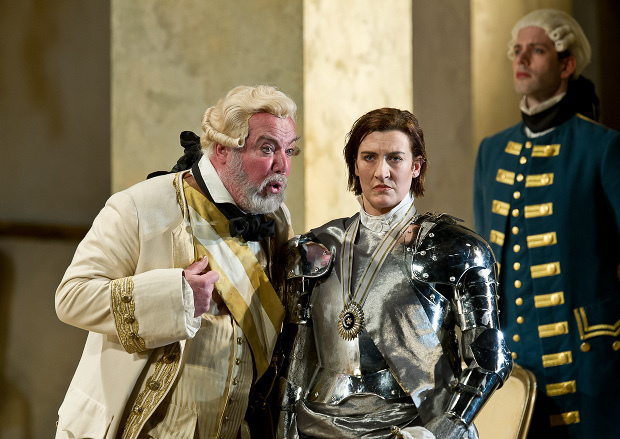 Oh wait, that’s Clemenza…well, except for the giant knife it *could* be Octavian and the Marschallin (unless this is a headcanon that they do in Ochs and the Feldmarschall and run off in that carriage together…#hereforit). Photo by Richard Termine via the Met’s Facebook page. I can’t embed it here to honor their rights to it, but check out this beautiful photo from the Royal Opera House of what has to be the end of Act 1. Sena Jurinac as Octavian, Elisabeth Schwarzkopf as the Marschallin, December 1959. Just look at the expression on Jurinac’s face! A Marschallin (Kiri Te Kanawa) and an Octavian (Frederica Von Stade) get together to sing Mozart sisters…just rather delightful, the fun they have with each other. The next suggested video per youtube is this classic, I love the chemistry suspended between them. One of my favorite little moments in Act 3 of Rosenkavalier is when the Marschallin, in full regal mode, basically says to Ochs, “WE ARE DONE HERE.” Of course it takes him 2 more pages (in my libretto) to get gone, because of course it does, but the Marschallin’s clear, dignified drawing of a boundary always gets me. “Er dar, Er dar in aller Still’ sich retirieren! AKA things I’m not over even though it’s 2018 now. AKA things I will never be over, if I’m honest. I mean, I could use one. You? Brigitte Fassbaender and Kiri Te Kanawa, 1985 Getty photo. Oh Renée. This is everything. Pretty sure we are all making that same face about the patriarchy, Octavian. I admit I am rather coveting that shiny armor. A 1992 Final Trio (and ending duet) with Renee Fleming, Frederica von Stade (in trousers, natch! ), and Kathleen Battle. I love it, and also Fleming learned a lot about the Marschallin in the ensuing years. If we ever get to have tea together someday, I would ask her about that. Anyway, it’s definitely more than 3.2 seconds of perfection.